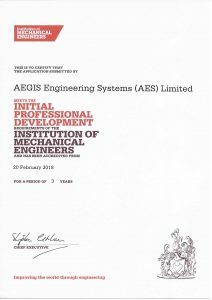 The Developing Engineer Scheme created by AEGIS specifically for its graduate Engineers has been accredited by the Institution of Mechanical Engineers. AEGIS is delighted to announce that its graduate scheme has now been formally accredited. The scheme was registered with the IMechE last year. This is great news for the company and the industry as a whole. During the accreditation process the committee was very complimentary about the scheme. They said it is well documented and managed, the quality of the mentoring was very pleasing and the range of roles and placements offered to the graduates gives good exposure to the full range of UK-SPEC competencies. AEGIS is committed to ensuring that new engineers are attracted to the Railway Industry and that they are given the opportunity to flourish and to learn. We will continue to review the scheme to ensure that it offers the best possible start for AEGIS graduates. Well done to all involved.